Honestly the only thing that comes to mind when I think tunic is Robin Hood and Peter Pan. Something long, with a sash, something worn in the renaissance period. When my husband heard about the Tunic challenge he basically said the same thing and proceeded to ask for me to make him a Robin Hood outfit. Unfortunately I denied him his medieval outfit, for now at least. I needed to take my Renaissance idea and give it a feminine and updated look. 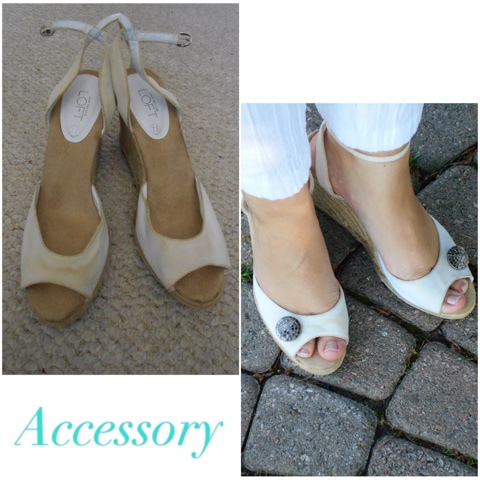 I began with these gauzy white pants and breezy button down. 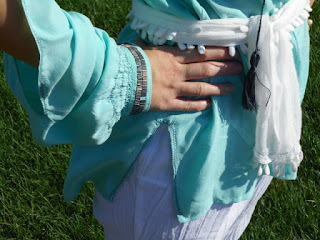 I just love the color of this button down! It actually had beautiful grey metallic beading at the collar and cuffs. I began by cutting off the existing elastic waistband and pinning a new casting for new stretchy elastic. I threaded through my new stretchy elastic. 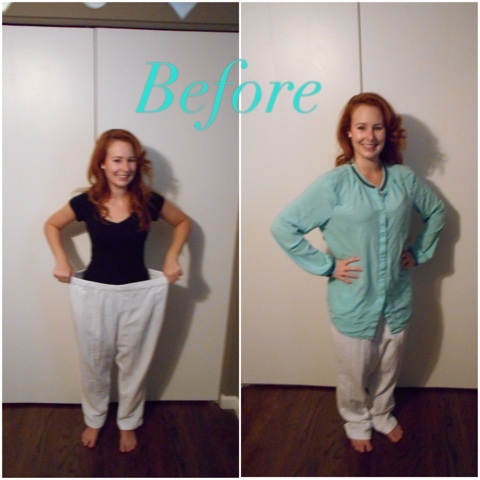 I used a pair of my favorite skinny jeans as a template to transform my gauzy pants into gauzy skinny pants! 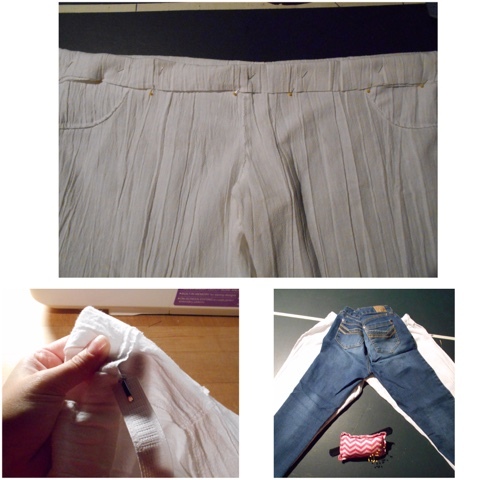 I pinned and stitched up the pant legs. I cut slits in each sleeve. I evened out the front of my top by sewing a straight line across. This made the front shorter than the back (common for a tunic). 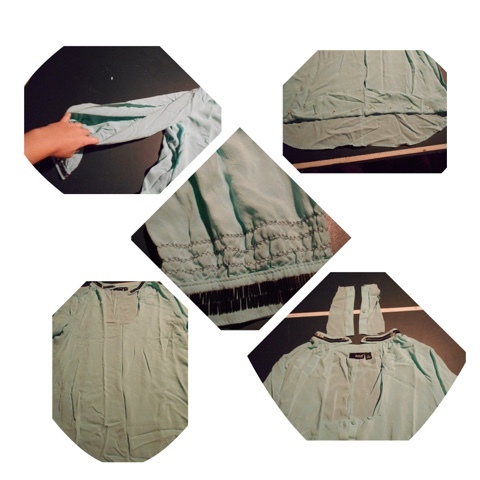 I cut out the buttons and button holes and sew the 2 pieces together. I cut out a square neckline. I also cut 2 slits in the sides. I outline the square neckline, arm slits and sleeve cuffs. 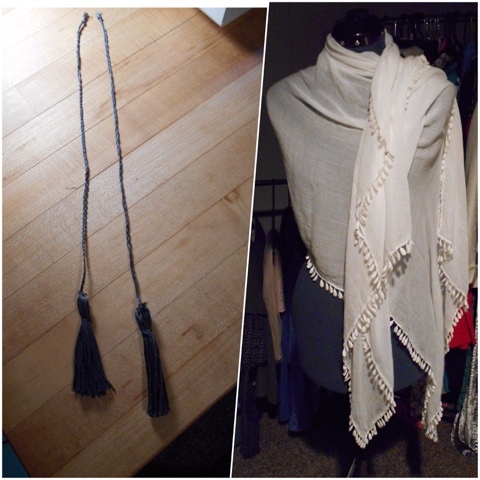 I made tassels out of grey embroidery floss and stitched them to the collar of my top. I took about 4 inches from this beautiful tasseled scarf and turned it into a sash to complete my tunic! P.S. For some reason, your post looked a little funky (it ran into the post below), and I ended up creating a new post. Not sure what happened, but everything looks good now. I love the cut out sleeves. They are really cool. The whole outfit is really pretty together. Great fit on the new pants.